This is the second in the series of tutorials. Here we will be installing a Linux system, and it's assumed that you have read the first tutorial and have carried out all the necessary preparation. By way of example we will be installing PCLinuxOS 2007, but the process is broadly similar for other desktop Linux systems. PCLinuxOS is supplied as a live CD which boots to a fully functional desktop system, and the installation is carried out from there. Some other Linux systems do the same, but others boot to an installation menu. In either case the installation process follows much the same pattern. Start up the PC and immediately open the CD/DVD drive and insert the CD. (Try not to take too long over this, otherwise the PC will boot from its hard disk and you'll have to do a reboot.) After a few seconds a menu will be displayed, and in most cases all you need do is hit Return to accept the first item ("Live CD"). The system should then boot. This takes some time because everything is being loaded from the CD, which is much slower than a hard disk. A dialog pops up asking you to choose a keyboard layout; select the appropriate one and click Next. Another dialog pups up asking you to choose a timezone (Europe --> GB if you're in the UK) then click Next. Now you are asked if you want to configure an NTP server. You can ignore this if you want, but it's a useful feature to keep your PC clock accurate so you might like to set it up. Then click Next. Finally you are invited to configure your network connection. You can ignore this too and configure it later, but it's worth doing it here, particularly if you use an ethernet connection to the internet (i.e. via a router). Click Next, and answer a couple more questions; the default answers are normally the right ones, but if you get it wrong you can put it right later. Click Next, and you arrive at the login screen. Log in as 'guest' with the password 'guest', then the system loads the KDE desktop and is ready to use. At this point you can explore the live system if you want (remembering that everything will be rather slow, running from the CD), or proceed directly to the installer. 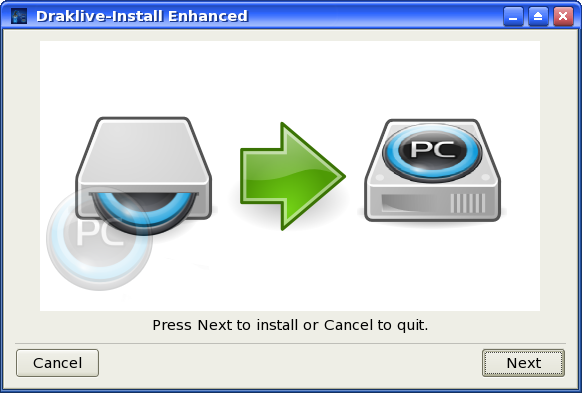 Double-click the desktop icon "Install PCLinuxOS". You will be asked to enter the root password, which is "root" (without the quotes). The installation wizard starts. Click Next. You are now asked if you want to install on a normal hard disk or a USB device. Select 'normal hard disk' unless you're feeling adventurous. Click Next. 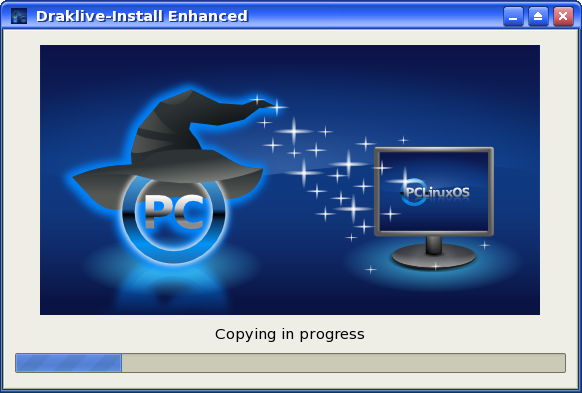 The partitioning wizard starts up. 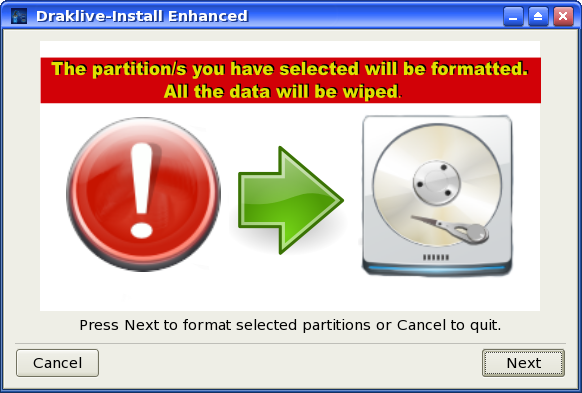 - If the disk is empty, or you don't want to keep any of the data on it, select "Erase and use entire disk". - If there is sufficient (> 4 GB) unallocated disk space, select "Use free space". - If a Windows partition occupies the entire disk, select "Use the free space on the Windows partition". The other options require a bit more knowledge, and I'll try to deal with that in another tutorial. Click Next. A warning is displayed. This is the point of no return. If you're happy with the choices you've made, click Next. 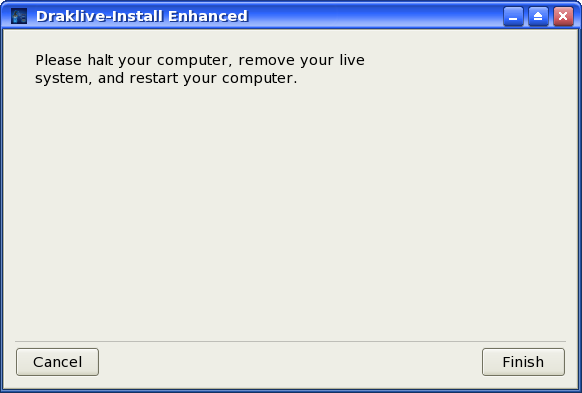 The Linux partitions are formatted, after which the "OK to install" dialog is displayed. Click Next. The new system is copied from the CD to your hard disk, and a progress bar is shown. This stage takes several minutes. When the file copying is finished the bootloader dialog is displayed. Usually you'll just accept the defaults here, so Click Next. 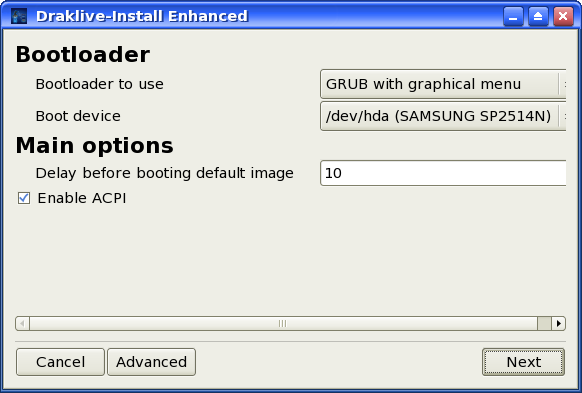 The boot menu configuration dialog is displayed. 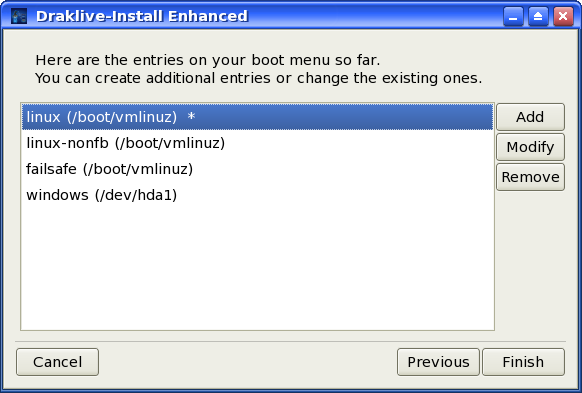 This lists the items which will appear on the menu when you boot the system after installation is finished. If you already have Windows installed, the last menu item should point to this as shown above. Normally you'll accept the configuration as it is, and click Finish. 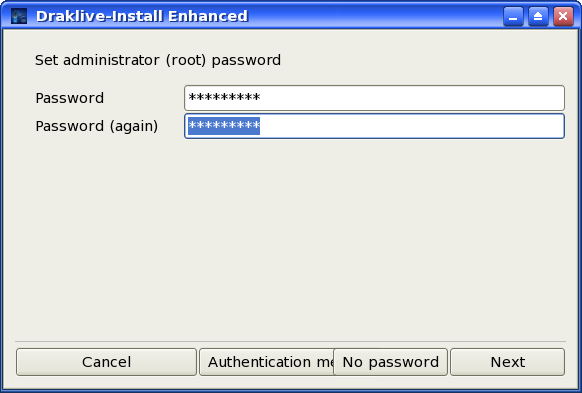 Next you are asked to specify the administrator (root) password. Choose a password which isn't a dictionary word, and preferably a mixture of letters and numerals, and type it twice as shown (it's displayed as asterisks). Don't forget what you've entered here. You'll need it in future. Click Next. 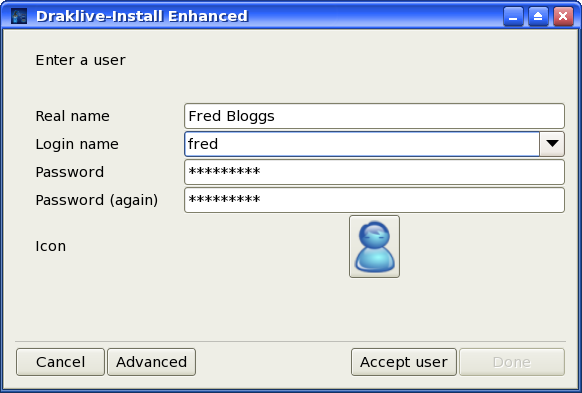 The user details dialog is displayed. You need to set up at least one user here, so fill in the details requested, then click Accept User. You can now enter details of another user if you want, otherwise click Done. The final message is displayed. Shutting down the system from the live CD is a little tortuous, but you won't have to do this when running the installed system. Right-click on the desktop and select Log Out from the popup menu. This returns you to the login screen. At the bottom of the screen, click System Menu --> Shutdown.. --> Restart Computer. The computer shuts down and ejects the live CD. Remove the CD and press Enter. The system reboots and the login screen appears. Log in using the username and password which you specified earlier. You're now using your new Linux system, so have fun.